Here's a little glimmer of hope for savers: The return on inflation-adjusted savings bonds will get a significant boost over the next six months. The U.S. Treasury has just set the total return on Series I Savings Bonds to 1.94% for all bonds sold between May 1 and Oct. 31. That's up more than half of a percentage point from last fall. The yield is better than you can earn on most CDs or money market accounts. We knew in April the total return would be at least 1.84% based on a measurement of inflation over the previous six months. But the inflation rate isn't all that goes into the total return you'll see from I Bonds. The Treasury Department also applies a fixed rate, which it set today at 0.10%, down a bit from last fall. The beauty of I Bonds is that the federal government tries to at least guarantee your money will keep up with inflation. But the total return on these safe investments had been in a steady decline until last fall, when the rate on newly issued bonds climbed from 1.18% to 1.38%. The total return on an I Bond is calculated by adding the fixed rate to the inflation rate, which changes every six months. The fixed rate is determined at the time you purchase your bond and does not change for as long as you own the bond. The inflation rate is calculated by the changes in the Consumer Price Index and shows the annualized inflation rate over the past six months. The CPI-U for September 2013 was 234.149, and the CPI-U for March 2014 was 236.293. That represents a six-month increase of .92%. To get the annualized rate, you multiply by two. 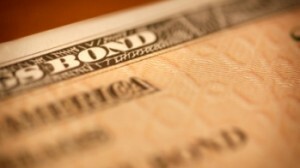 Newly issued I Bonds will pay more than all but the best nationally available 5-year CD rates. The top deal now pays 2.31% APY. You don't have to pay tax on the interest you earn until the bonds are redeemed. With CDs, you're taxed on the interest in the year it's earned. Interest earned on savings bonds is exempt from state and local income taxes. That's a big plus for residents of states that levy a hefty tax on investment income, such as California and New York. You can buy savings bonds at TreasuryDirect (www.treasurydirect.gov) and have them issued electronically to your account. Don't bother looking for paper bonds as the Treasury Department stopped issuing them at the beginning of 2012. The only exception is that you can buy up to $5,000 in paper bonds using your tax refund by filing IRS Form 8888. Learn the 10 secrets to successfully save for retirement. Building enough wealth to support yourself later in life has become a lifelong task that starts the first day of your first job and doesn't end until your final day of work. But it can be surprisingly easy if you make just a few savvy decisions — and avoid just a few stupid mistakes. Secret No. 1 is "Don't be discouraged …"
At the Treasury website, you can buy up to $10,000 in Series I Bonds and another $10,000 in Series EE Bonds. Paper Series EE bonds are issued at half of their face value. So you'll pay $500 for a $1,000 bond, but it will not be worth the face value until it matures. Do be aware that to avoid any early withdrawal penalty, you'll have to hold onto the bonds for five years. Redeem them earlier, and you'll forfeit the three most recent months' worth of interest.